Romania is going through its best agricultural year in history. 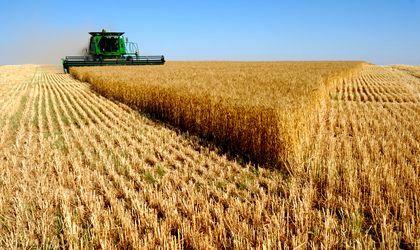 Record production of wheat and maize places agricultural turnover close to EUR 8 billion, KeysFin experts say in an analysis of business developments in the sector. Data from the Agriculture Ministry shows that this year’s wheat production is more than 200,000 tonnes higher than last year, exceeding 10 million tonnes, while maize would be between 14.5 and 15 million tonnes, compared to just 11.8 million tons to be harvested in France. This means that Romania will take over the crown of the largest European maize producer, according to the estimates of the General Association of Maize Producers (AGPM). The country also has a good production for barley, which is much higher than last year. According to KeysFin analysts, spectacular performance in the agricultural sector is due to major investments in the sector. ”Significant investments have been made in optimizing production flows, from using efficient seeds to streamlining and upgrading crop maintenance and mechanized harvesting, including through satellite monitoring. In many ways, Romanian agriculture has taken huge steps to modernization, and the effects are seen in growing crops from year to year,” KeysFin analysts show. Romanian agriculture currently operates around 12,727 companies specialized in plant cultivation, which generated over 64 percent of all agricultural businesses last year. More than 3,247 companies (29 percent of total turnover) are engaged in animal husbandry, and 1,272 companies are active in the mixed agricultural activities sector, which provides 7.6 percent of the total agricultural business. According to KeysFin data, agriculture businesses increased by 20.7 percent in 2017 compared to 2013 and by 6.8 percent compared to 2016, to RON 35 billion, and by 2018 it is estimated to exceed the level of RON 36 billion. ”Excellent production results for wheat and maize would make a significant contribution to this record, but unfortunately, there were major problems in the livestock sector, where swine fever has significantly affected the affairs of producers and distributors,” experts say. Beyond the swine fever crisis, it is certain that the interest for agriculture is growing among investors. The proof is that the number of companies increased by more than 7 percent compared to 2013 to 17,246. Moreover, 1,450 new companies were set up in the first 7 months of 2018 (a 27 percent advance over the same period in 2017), but nearly 6,500 have disappeared, 33 percent more than in the first months of 2017. ”Romanian agriculture is in the process of consolidation, as many mergers and acquisitions have taken place in the market during the last 2-3 years. They are mainly foreign investors who have taken over large areas of land and farms, the logistics support that allowed the development of these record crops, despite drought problems,” said the consultants. The number of employees in agriculture increased by 6 percent compared to 2013 to 85,400, but decreased by 2 percent compared to 2016. Interestingly, in 2017, the average cost per employee grew much faster than labor productivity, by 63.4 percent versus 2013 and 18 percent versus 2016, to RON 3,540 per employee. Labor productivity in this sector marked last year a 14 percent gain over 2013 and 9 percent more than in 2016. According to KeysFin data, the largest businesses in Romanian agriculture are in the counties of Timis (RON 2.85 billion), Călăraşi (RON 2.54 billion), Constanţa (RON 1.93 billion), Buzău and Satu Mare with business of RON 1.6 billion each. The top of the growers is led by Agro-Chirnogi SA, with a turnover of RON 880.6 million in 2017. The company is followed by Promat Comimpex SRL (RON 541.5 million), Plantagro-Com SRL (RON 439.7 million), Agricost SA (RON 359.2 million) and Wine Solutions Network SRL (RON 284.2 million). In the top 5 livestock breeders, Smithfield Romania SRL ranks first, with businesses of RON 920.1 million, followed by Transavia SA with RON 531.5 million, Agrisol International SRL (RON 291.5 million), Avicola Buzau SA (RON 264.3 million) and Avicarvil SRL (RON 159.3 million).